Take a tour of newly industrialized West Lincoln | Mothers Against Wind Turbines Inc. 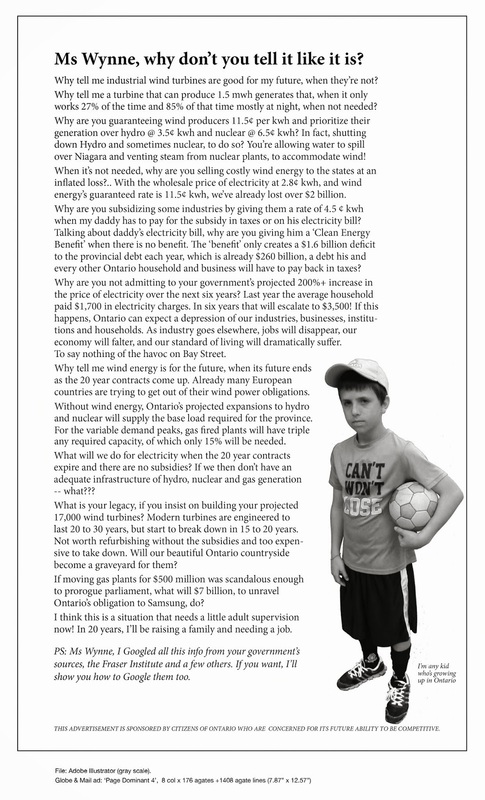 I invite you, and your readers in Niagara Region to take a drive through West Lincoln township and view the INDUSTRIAL wind turbines that are being installed there. You will be awed by the size of these turbines, so much so, that you will never again call them “windmills”. You do not need a map: just start at the Transmission Station just past Wellandport and follow the orange stakes down Canborough, Port Davidson Road, Sixteen and Tober Road, Road 6, Twenty hwy, Road. 5 , Young Street, Walker Road, and Mountain View Road. (The stakes can always be found opposite existing transmission lines). These stakes are placed in the road allowance to mark the location at which the transmission poles will be placed. You will also notice, on Canborough, Port Davidson, Tober and many of the side roads, the construction of the connector lines, which are to be buried and eventually, bring the raw power from the turbines to the transformer station where they will be transformed into 230mw of power which will travel on the 115kw lines down the transmission lines. Realize that all 77 turbines will be connected by connector lines. There will be miles of these lines criss-crossing along most of the county roads in the township. Plan your trip to include Vaughn Road to get a really good taste of the mess that the residents of these roads have to put up with, on a daily basis, knowing that the process will take until August 2016 at the earliest. Notice I did not tell you where to find the turbines. You will not be able to miss them. From kms away you will see the activity. If you want to see construction, visit Gee Road where the turbines are located close enough to the road for you to get a good look at what is happening at each and every turbine construction site. The security people can not prevent you from taking a good look from these two sites. This past week a brand new interest has been added. Drive the proposed transmission line from the proposed Transformer station on Canbourgh and you will see bright green florescent ribbons on just about every tree on the opposite side of existing transmission lines. Each and every tree that is marked is slated for demolition for building of the transmission line. The irony of it will almost make you laugh: trees are natures best defense against climate change. Trees produce CO2 which is Natures air purifier, and hundreds and hundreds of trees are being removed for a transmission line which will produce Radon emissions and stray voltage, as well. Trees create an ecosystem to provide habitat and food for birds and other animals. Trees absorb carbon dioxide and potentially harmful gasses, such as sulfur dioxide, carbon monoxide from the air and release oxygen. One large tree can supply a days supply of oxygen for four people. Our trees, and the health of our community is being sacrificed for Industrial Wind Turbines which are not efficient, not green, not economically feasible or affordable, not nature friendly and riffed with controversy. After you have taken your drive in the (newly industrialized) countryside, can you still say that it is worth the sacrifice of rural Ontario for the “common good”. Does this Industrialization of rural Ontario make any sense to you? Please contact your municipal officials and the MOECC and express your opinions and concerns to them. Previous PostThe High Church of Global WarmingNext PostNiagara Region Wind Farm…previously know as NRWC makes more changes to previously approved plans…..